Sweet Summer Fun at the P-Town Parade! On August 20th 2015, thousands of bystanders gathered along Commercial St in P-Town to enjoy the 37th annual week-long Carnival on Cape Cod. Every year, around 90,000 people find themselves making the trek to the tip of The Cape for one of the largest outdoor events annually held in Massachusetts. The Provincetown Parade is a celebration of diversity and a celebration of “P-Town: the gayest city in America”! 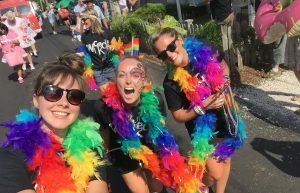 The Pride Festival last year was Candy Land themed, so, naturally, we found ourselves strutting the streets wearing gumdrop caps, colorful face paints and rainbow boas singing “Marshmallow World” on repeat as the Wicked-Candy-Mobile tossed beads at the dancing crowd. None of our garb, though, competed with the decked-out Lady Twizzler, Zebra Gum Twins, Lifesaver Queen, etc. etc. etc. The costumes that day were to die for! The sun was blazing (and chocolate was melting) but joy, humanity and sweetness filled the air. This upcoming weekend is the 38th annual parade featuring a ‘back to the 80’s’ theme! 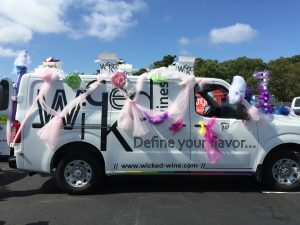 Send in your weekend photos to be entered to win a WICKED swag bag and a chance to be featured by Wicked Wines! Let’s be WICKED good friends! This entry was posted in Events and tagged Candy Land, Cape Cod, Carnival, Destination Festival, Drink it. Be it., Family Event, Gay, Gay Pride, Global Wines Inc, LGBT, P-Town, Parade, Providence Town, Summer Celebration, Wicked, Wicked Wines, Wine. Bookmark the permalink.